Select from the most comprehensive range of indoor colored concrete floor coating products available in the region. 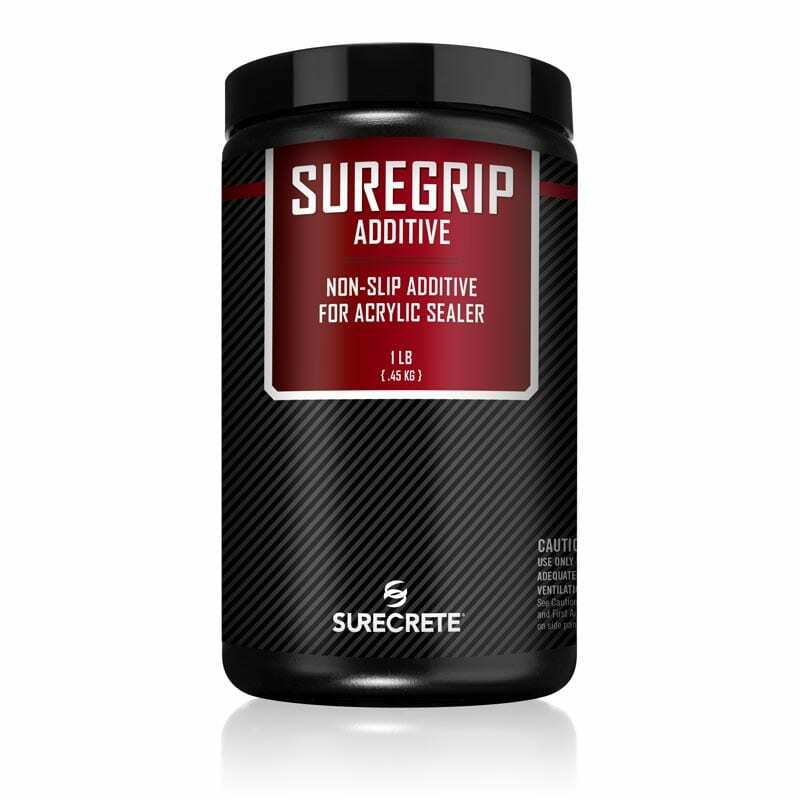 Turning Point Supply carries in stock the full complement of interior colored concrete sealer materials from SureCrete Design Products. The OnDemand Color System assures you that we will always have available the color you need for your indoor colored concrete floor coating project, using the only alkaline-resistant pigments in the industry that will not fade over concrete. Choose the best interior colored concrete sealer material available anywhere in North Carolina and South Carolina. These interior colored concrete sealer systems are designed for commercial, industrial and manufacturing spaces, and are the best indoor colored concrete floor coating material options for retail and residential locations. ColorTec 400 is a high gloss, high-performance, durable colored concrete coating for concrete surfaces such as warehouses where high traffic protection is needed. Manufactured with high-quality raw materials and UV stable pigments, our solvent colored polyurethane is a builder and contractors preferred concrete coating. SureCrete Design Products ColorTec 400 colored solvent polyurethane floor coating is ideally suited for both commercial and residential settings throughout North Carolina and South Carolina: aircraft hangars, clean room floors, manufacturing facilities, warehouses, bars, clubs, retail stores, automotive showrooms, residential interiors, garage floors, stadiums, or any high traffic area where an exceedingly resilient floor is required. 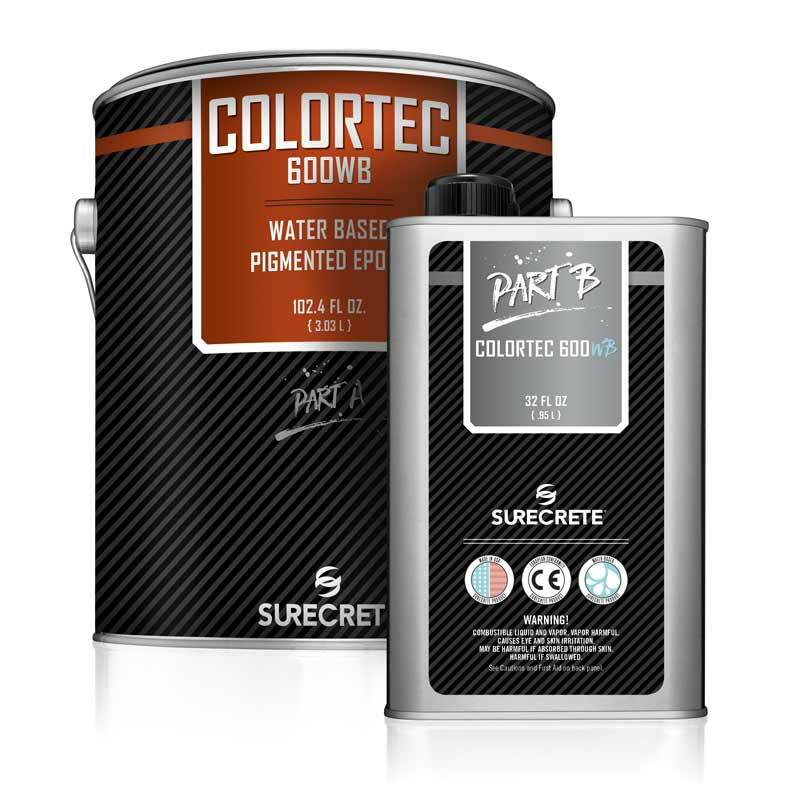 SureCrete Design Products ColorTec 400WB commercial grade water-based colored floor polyurethane is manufactured to withstand punishing from forklifts and other industrial traffic. ColorTec 400WB polyurethane floor coating has a low VOC rating and can be used in nearly any high traffic indoor concrete application. ColorTec 400WB Colored Water Base Polyurethane Concrete Floor Coating may be applied directly to concrete or used as a finish coat over an epoxy concrete floor coating. ColorTec 400WB is available in over 200 colors from the SureCrete Design Products OnDemand concrete coating tint system. 250 HP Cyclo is a 100% solids, two component, cyclo-aliphatic amine epoxy system with excellent durability including abrasion resistance, chemical resistance and hot tire resistance. 250 HP Cyclo is a user friendly high performance concrete flooring system. EpoPack-HP is a 100% solids, concentrated, tint system specially formulated for 100% solids 250 HP Cyclo Epoxy. EpoPack-HP is formulated with high quality, ultra fine particle pigments that easily disburse in 250 HP Cyclo Epoxy. EpoPack-HP is a superior choice to obtain a semi transparent stain or a solid opaque colored finish in 250 HP Cyclo Epoxy. ColorTec 180 colored polyaspartic concrete floor coating is a penetrating, film forming, high gloss fast cure industrial grade system. ColorTec 180 may be used stand alone for solid color concrete floor projects and as the receive coat for decorative vinyl flakes in a same day flake floor and quartz aggregate coating systems. ColorTec 180 is suitable for high traffic projects such as aircraft hangars, manufacturing facilities, warehouses, bars, retail stores, grocery deli and meat preparation areas, showrooms and service centers. The best indoor colored floor coating materials for any interior colored concrete sealer project are available from Turning Point Supply in Charlotte NC and Raleigh NC. These are not concrete paint, but true colored concrete sealer systems. Most of your other options are paint formulas that have been modified for application to concrete, but those indoor colored floor coating systems cannot handle the alkalinity of concrete or withstand moisture vapor migration. SureCrete Design Products and SurfKoat Surface Koatings interior colored concrete floor coating materials are engineered for colored concrete commercial floors, colored coating manufacturing floors, commercial kitchen floor coatings and other heavy traffic applications. SureCrete Design Products ColorTec 600WB Waterborne Colored Concrete Epoxy Floor Coating is a two component 52% solids, low VOC floor coating system that is used in a wide variety of applications in North Carolina and South Carolina: durable colored layer for both new and old interior concrete floors, primer coat, and binder for DK Flakes and Metallics. The high loading of SureCrete pigments achieves the preferred substrate hide and color uniformity in over 200 colors. May be applied on fresh concrete as soon as three days after pouring and placing concrete. ColorTec 400 solvent based gloss colored floor polyurethane concrete coating is a two component 51% solids, acrylic aliphatic polyurethane. 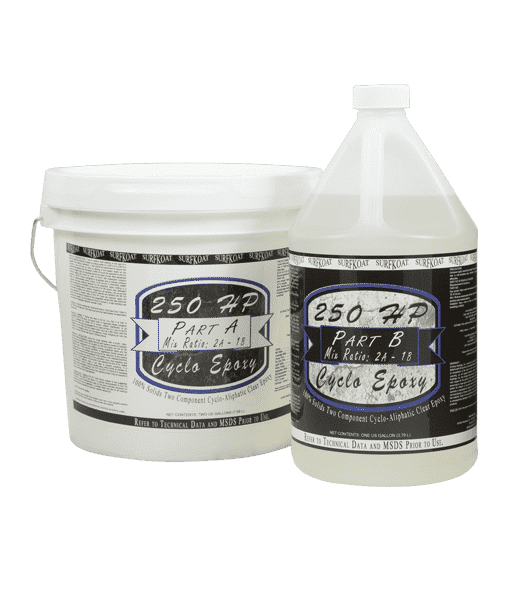 It is designed as a non-yellowing thin mil color coating for interior concrete, cement based overlays, or as a top finish coat on epoxy systems in North Carolina and South Carolina. This high performance pigmented top coat generates the premier balance of strength, added UV stability, flexibility, chemical and scratch resistance that is both user-friendly and extremely durable. 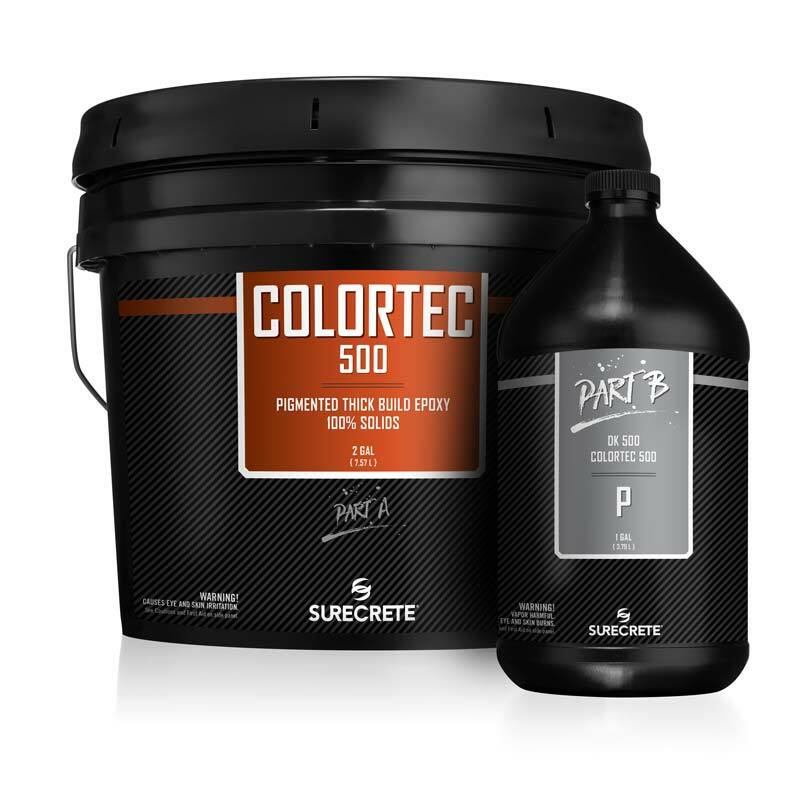 SureCrete Design Products ColorTec 400WB water based colored floor polyurethane coating is a two component 57% solids, pigmented acrylic polyurethane designed as a non-yellowing thin mil color coating for concrete, cement-based overlays, or as a top finish coat on epoxy systems. The high performance pigmented top coat provides excellent durability in high traffic areas similar to a solvent base system but with the ease and safety of a low VOC (73 g/L) water base system. The OnDemand concrete coating color system at Turning Point Innovations in Charlotte NC uses alkaline resistant pigments which are UV stable and will not fade. Choose from hundreds of colors, or we can match your color selection from nearly all other manufacturers. ColorTec 500 100% Solids Colored Epoxy Concrete Floor Coating System is often used as a single coat system for faster return to service. SureCrete Design Products Colored Concrete Floor Epoxy system is the superior pigmented concrete coating system available on the market today. The pigments used by SureCrete’s tinting station are far more durable and UV resistant than typical pigmented concrete sealers. With tints and pigments like these, your finished Colored Concrete Floor Epoxy 100%, epoxy coating system will last much longer than a normal Colored Concrete Floor Epoxy 100% epoxy sealer ever would, with the color staying much more vibrant over a long period of exposure. Not only are the tints more durable and UV-stable than typical colored concrete sealers, but the color range available is also a great deal wider than those available on the market today. Pigmented ColorTec 500 Epoxy 100 is available in more than 200 standard colors and now, with the power of the tinting station, all these colors and more are available same day from Turning Point Innovations in Charlotte North Carolina. We can even match your color palette from a different manufacturer such as Sherwin-Williams, Dupont, Baer, Valspar or PPG Paints. Excellent for a variety of seamless, high build concrete flooring applications. Enhanced flow and leveling properties make this a favorite of flooring contractors. Use this product as the base coat and metallic coat in the Metallic FX flooring system. 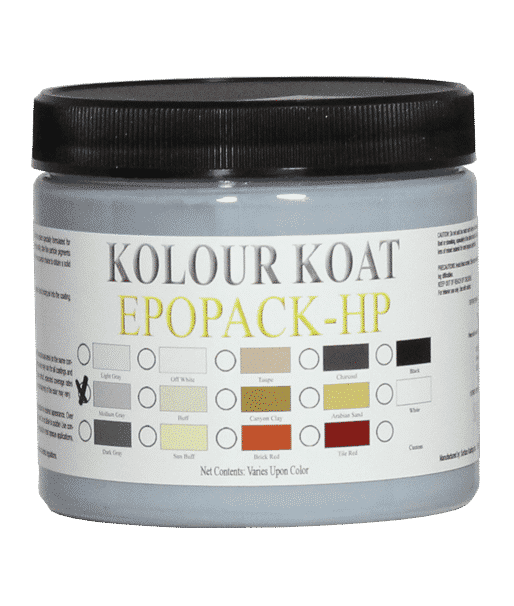 Can be tinted for solid color applications with SurfKoat’s Kolour Koat Epopack-HP. Very economical, easy and decorative way to coat a variety of concrete substrates. Easily disperses into 250 HP Cyclo Epoxy. Very easy way to create a beautiful, solid color concrete surface. SureCrete Design Products industrial grade ColorTec 180 concrete colored floor polyaspartic coating system is a fast drying high traffic interior high gloss durable coating product. ColorTec 180 has an extended pot life for user friendly application and reduced roller lines. The fast recoat interval reduces labor costs and provide a quick return to service for high demand commercial and industrial floor coating projects anywhere in North Carolina or South Carolina. ColorTec 180 is a part of one day floor coating systems allowing same day concrete floor coating projects.